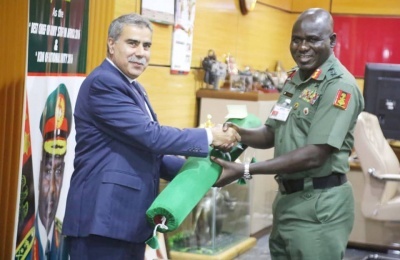 OPENING REMARKS BY THE CHIEF OF ARMY STAFF LT GEN TY BURATAI NAM OMM (BR) GSS psc(+) ndc (BD) FCMH FNHAM BA (Hons) MA MPhil AT THE CHIEF OF ARMY STAFF MEETING WITH PRINCIPAL STAFF OFFICERS GENERAL OFFICERS COMMANDING OPERATIONAL COMMANDERS AND DIRECTORS HELD AT ARMY HEADQUARTERS CONFERENCE ROOM ON 6 MAR 19 Protocol 1. Once again let me welcome you all to another expanded weekly meeting as done 2 weeks ago. I want to use this opportunity to congratulate you all for the professional manner in which you executed my directives for Operation SAFE CONDUCT. The proactive intervention of NA in the recently concluded Presidential and National Assembly Elections contributed greatly to its successful conduct and credibility. 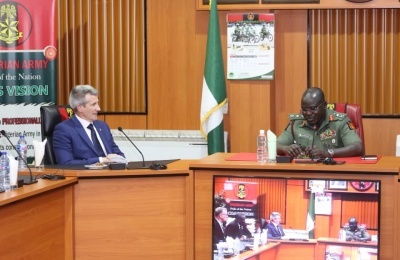 I am glad to note that both international and local observers and indeed the Nigeria print and electronic media applauded the professional role played by the Nigerian Army in ensuring that a secure and conducive environment was created for eligible voters to exercise their civic rights. Unfortunately, some level of violence was still recorded leading to disruption of polls, burning of ballot boxes in some areas as well as loss of lives, including the death of an officer and 3 soldiers. 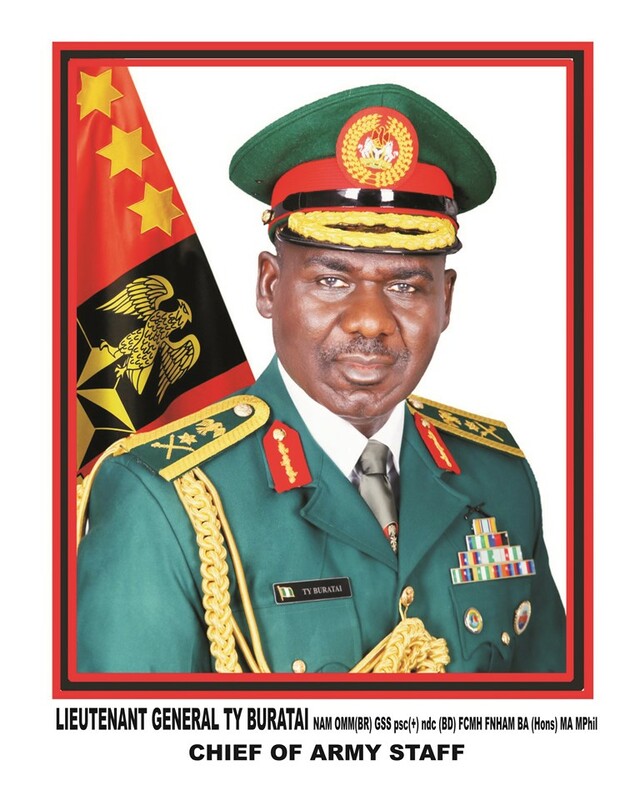 The Nigerian Army to a larger extent ensured that the large scale electoral malpractices and acts of thuggery aimed at disenfranchising voters as witnessed in previous elections were curbed despite the campaign of calumny orchestrated by some politicians against the army. 2. Overall, I am delighted to note that the first phase of Operation SAFE CONDUCT was a huge success. Despite the bomb explosion in some parts of Maiduguri and attack in Geidam, troops of Operation LAFIYA DOLE were able to decisively defeat the attacks and secure the theatre for successful conduct of elections. We must therefore consolidate on this success and prepare adequately for the second phase of the election by reviewing our plans with a view to correcting observed lapses to ensure peaceful polls that will reflect the wishes of Nigerians and their rights to determine those that govern them. 3. Recent security threat assessment and analysis of the coming elections showed that politicians have made plans to use all means available to truncate the peaceful conduct of the elections. There are indications of their intent to take advantage of and to use the farmers/herders crisis, armed political thugs and ethnic militias to perpetrate acts of violence including bombings. Some of them also intend to infiltrate domestic staff of political opponents, employ mercenaries to carry out acts of assassinations, use the social media for smear campaigns, hate speeches and spread fake news in a bid to disrupt the peaceful conduct of the elections. We must not allow them to succeed. 4. Let me reiterate that the NA will enforce all guidelines in support of the Nigeria Police Force to ensure the peaceful conduct of the elections in line with its constitutional roles. I therefore want to remind us all not to rest on our oars. We shall not allow those who are determined to undermine our electoral process to succeed. These forthcoming gubernatorial and state assembly elections are very crucial. These are elections that touch on the interest of the people at the grassroots and could likely be volatile in nature. It is important to reiterate that politicians will employ and deploy all means to outwit each other to gain control of power at this level. We may recall that in the recently concluded polls, some politicians in their quest for power, armed thugs and miscreants with automatic weapons; induced and coerced youth corpers and INEC ad-hoc staff to perpetrate acts of electoral malpractices. We must therefore continue to support the NPF and other security agencies to prevent these malpractices from occurring again. I therefore urge all commanders to work assiduously and closely with the civil authorities and all law abiding individuals as well as groups to ensure the success of the forthcoming elections. 5. 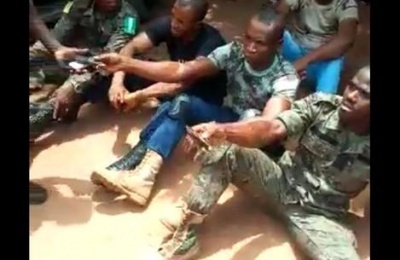 During the course of the recently concluded elections, troops of the Nigerian Army were able to make arrests of persons who perpetrated acts of electoral offences. These suspects have been handed over to the police for prosecution. 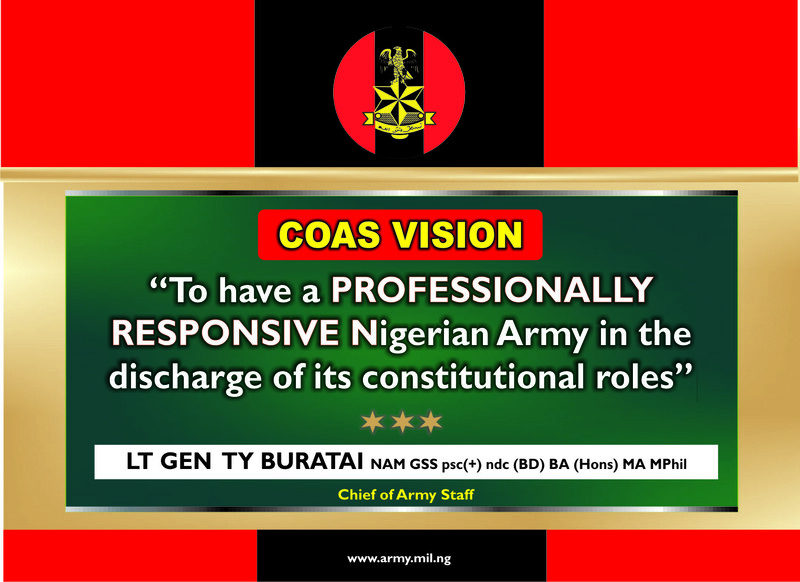 I want to state, and categorically warn that the Nigerian Army will not tolerate any acts that will undermine national security. This time around we shall be tough on those who plan to rig or disrupt the electoral process. I therefore want to appeal to Nigerian youths to shun any attempt by any politician to use them to perpetrate any form of violence. 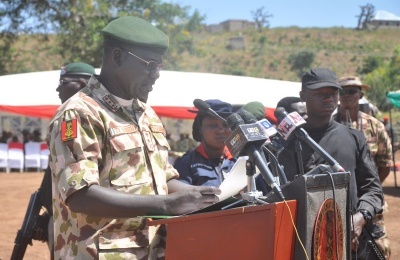 As we mourn the death of the young officer and soldiers killed in the course of their lawful duty during the recently held elections, I want to assure their families that their death will not be in vain. In line with the tradition of the Nigerian Army they will be given heroic burial as they are indeed the heroes of our democracy. I have directed that their full entitlements be paid. Let no one be in doubt that those desperate politicians and criminals that attacked our troops in the course of carrying out their legitimate duties will be tracked down and brought to justice. 6. We have all seen the advantages of the NA Situation Room for Elections Security Monitoring. This laudable innovation to security monitoring has received accolades from different quarters and is already promoting inter-agency cooperation. There is no doubt it assisted us in timely decision making and more timely response to situations. I want to urge all commanders to further key into the platform. As we take decisions and respond, we must have at the back of our minds that the army must remain professional and apolitical all through the electoral process. 7. There have been reports of alleged compromises by some personnel during the elections. We have received complaints from some stakeholders, major political parties, Governors of Bayelsa, Oyo Ogun, and Imo States of allegations of misconduct as well as unprofessional conduct by some of our personnel. Unfortunately some other states have gone to the press with unsubstantiated allegations without resort to the NA leadership. Nonetheless, all these complaints are noted and will be addressed appropriately. 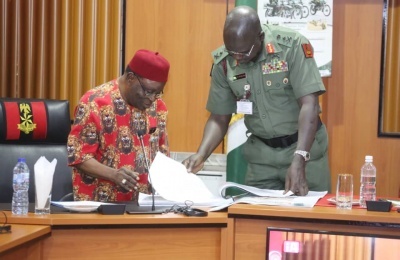 A high powered committee had been convened and instituted to investigate all cases of alleged misconduct by troops arising from the 2019 General Elections. 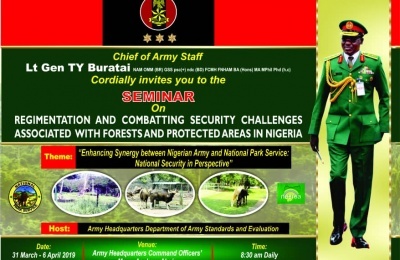 This is aimed at ensuring that all cases are thoroughly looked into for the purpose of dispensing justice and to uphold Nigerian Army’s credibility, professionalism and apolitical stand. 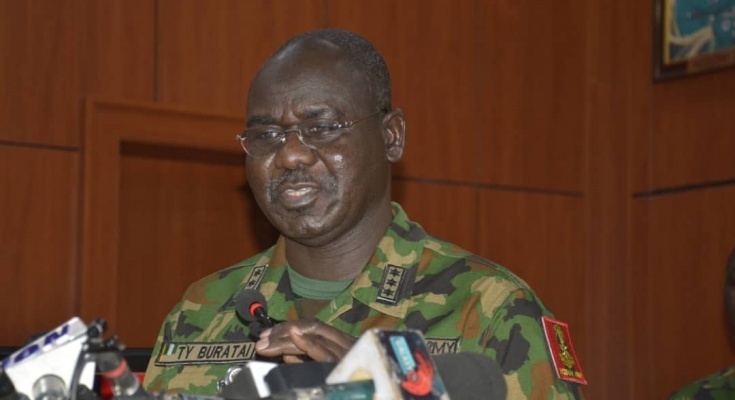 d. Commanders must deal decisively with any electoral crime or action such as electoral thuggery, snatching of ballot boxes, illegal possession of electoral materials and firearms as well as other crimes that could mar the smooth conduct of the election. i. Commanders must maintain force protection and respond decisively to prevent any surprise attack on troops of Operation SAFE CONDUCT and eligible voters by armed militia groups or political thugs. l. Commanders must ensure troops under their command remain apolitical and should deal ruthlessly with electoral law breakers as well as avoid compromise with any politician and political party.